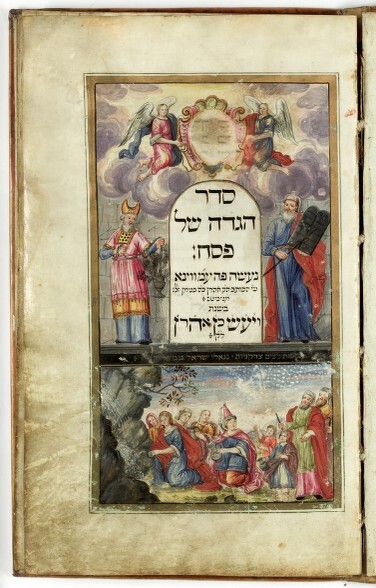 Zürich, Braginsky Collection, B284: Haggadah with Yiddish instructions and translations of concluding songs (Herlingen Haggadah) (http://e-codices.unifr.ch/en/list/one/bc/b-0284). A Journey through Jewish Worlds. Highlights from the Braginsky collection of Hebrew manuscripts and printed books, hrsg. E. M. Cohen, S. L. Mintz, E. G. L. Schrijver, Amsterdam, 2009, p. 116-117. Schöne Seiten. Jüdische Schriftkultur aus der Braginsky Collection, Hrsg. von Emile Schrijver und Falk Wiesemann, Zürich 2011, S. 94-95.